If you were to build your own home solar power system, you have to understand, there are multiple components involved to make it work. The key components are the solar cells, array DC disconnect, inverter, AC breaker panel, power meter, battery etc. Each component plays a very important role. In this blog post, I wanted to write about the battery. The battery for a DIY solar power system will be used to store the electricity generated by the solar panels. The electrical appliances at home usually are not connected directly to the solar system. This is because the power output from the solar cell fluctuates due to inconsistent amount of sun light hitting the cells. This will cause the electric current to fluctuate also. For example, if you were to connect a 50 watt light bulb to the solar array, the light produced by the bulb will flicker due to the power fluctuation. To make the system work, the electricity generated from the solar cells is directly to a battery bank for storage. How many battery units do you need? This will depend on your household power requirement. If you are planning to connect multiple electrical equipment to the system, you may need anywhere from 15 to 20 units of battery. As you can see, there would be a problem to this which is the “cost”. Buying brand new battery from the hardware shop can be quite expensive. Remember, you still need money to buy the other components. Are there any places where we can get cheap batteries on the web? Yes there is…and we are off to ebay! Ebay is one of my favorite places to look for cheap parts. I did a blog post on how to find cheap solar cells on ebay a few weeks ago. Now we look for inexpensive batteries. The search process is still the same. First, go to ebay web site. Remember to choose a local ebay site to save on shipping and transportation charges. Before we begin the search, you have to know the right type of battery to look for. For a DIY solar system, the suitable battery is the deep cycle type. Now we go shopping! On ebay main site, type in the phrase “deep cycle battery” in the search box on the top left. Next, hit the “Search” button. You will then be presented with all the listings with deep cycle battery. The next process is the tricky part. We have to go through all the results. Here’s a tip that I learned from Michael Harvey’s Earth 4 Energy e-book. 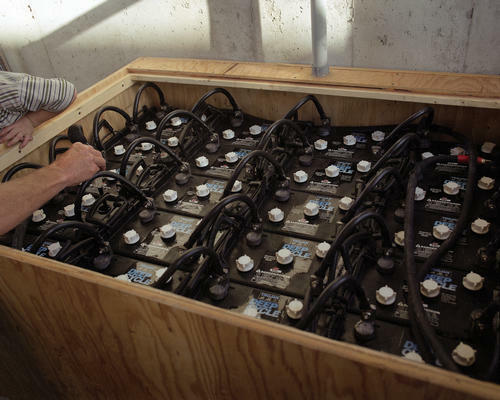 Look for used or reconditioned deep cycle batteries. These kind of offers are the cheapest. You may have to search a few times before you find the perfect deal. Here’s another tip, make sure the selling price is inclusive of shipping and handling. If not, you will end up paying all the charges yourself. To increase your chances of finding the best deal, it is recommended for you to do a search on ebay a few times a week. New users are logging on to ebay every day to trade goods and services. Some people may just have surplus batteries to off load. You want to be the first one to find them. For more tips and tricks on finding cheap parts for a homemade solar power system, be sure to check out the Earth 4 Energy manual. If you are wondering whether Earth 4 Energy is a scam, read our review write up on the e-book. 2) Renewable Energy Industries Association – Declare your energy independence!